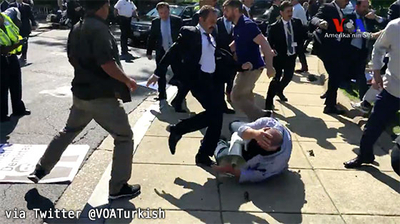 When Turkish President Recep Tayyip Erdogan visited Washington, D.C. this past May, he was greeted outside the home of the Turkish ambassador by a small group of protesters concerned about his crackdowns on civil rights and antagonism towards Turkey's Kurdish population. Within minutes, his bodyguards sprang into action, accompanied by others in the Turkish posse, beating and kicking the protesters – who included women and senior citizens. A 61-year-old woman later told the Guardian she had feared for her life after guards punched her in the face, and when 60-year-old Turkish-American Reza Dersimi tried to assist her, he, too, was assaulted. Local police quickly intervened, arresting several of the attackers, including Erdogan's guards. Some of those who ran off were apprehended in the days that followed but many remain at large. The arrests infuriated Turkey's president. "They have incarcerated our citizens!" cried Erdogan, who has regularly thrown foreign journalists and human rights leaders into Turkish prisons. "How is that possible? What type of legislation is this, what type of law?" Now the U.S. government has indicted 19 attackers for their violent abuse of the protesters, whom Turkish leaders accuse of having been members of the Kurdish terrorist group PKK. (There is no evidence to suggest any protester had terror ties.) Turkey's Foreign Ministry described the indictments as "unjust and biased," and claimed they included "names of people that have never been to the US." The indictment against 15 Turkish security guards, two Turkish-Canadians, and two Turkish-Americans, contains 21 counts of assault and hate crimes, and describes the incident as a "conspiracy to assault protesters and law enforcement officials." "The members and associates of the conspiracy significantly outnumbered the anti-Erdogan protesters, growing in size as the protest continued," the indictment states. "The members and associates of the conspiracy both vocally and physically opposed the presence of the anti-Erdogan protesters, yelling threats and attacking the anti-Erdogan protesters ... The members and associates of the conspiracy used threats and physical violence – intensely kicking at protesters – to dispel the anti-Erdogan protesters, attack the anti-Erdogan protesters, and blatantly ignore American law enforcement commands to cease the violence." But rather than apologize for the violence, Erdogan declared the indictment "scandalous," praised the attackers for stepping in, and decried America's failure to protect him from the protesters. True, some protesters did shout "Long Live the YPG," referring to a Syrian-Kurdish militant group that the United States has engaged, but which Turkey deems a terrorist organization, in its fight against the Islamic State. But such cries, in a democratic state, hardly call for a violent response. Moreover, Erdogan's objections reek of hypocrisy. In the past two years, his government has detained numerous foreign nationals on trumped-up charges of "terrorism," a word Erdogan bandies about to describe critics of his ideology or his regime, including human rights workers and journalists. He has called on foreign governments to arrest their own citizens for statements critical of him, such as his April 2016 demand in April that Germany charge comedian Jan Böhmermann for his profanity-laced poem criticizing the Turkish president. And only days later, Dutch-Turkish columnist Ebru Umar, vacationing in the Aegean coastal town of Kusadasi, was pulled from her bed in the middle of the night by police and arrested for cursing Erdogan on Twitter. She was released from custody he following day, but not permitted to leave the country for several weeks. Other dual-citizens have suffered similar fates or worse, such as German-Turkish Die Welt reporter Deniz Yucel, who was arrested in February on charges of "terror propaganda and inciting hatred," according to CNN. Yucel had "interviewed PKK leader Cemil Bayik 'under the guise of being a journalist' and reported on security forces' operations in Turkey's southeast against Kurdish militants by 'undertaking propaganda by expressing the discourses of the armed terror organization,'" the prosecutor's office told CNN. But it's not just dual nationals. The July arrest of German activist Peter Steudtner and several others attending a workshop on digital security – again on terrorism charges – led German Foreign Minister Sigmar Gabriel to issue a warning to Germans about visiting Turkey. French freelance reporter Loup Bureau was also taken into custody last month, again on charges of assisting terrorists. The charges were based not on anything he was doing at the time, but on a 2013 story he had produced about members of the YPG for France's TV5 Monde. And in one particularly notorious case, Turkish police arrested British VICE reporters and their Iraqi fixer in 2015 in Diyarbakir, a city with a large Kurdish population. The charge: "knowingly and willfully helping the armed terrorist organization without being part of its hierarchical structure," according to Turkey's Anadolu News Agency. Although court papers did not include the name of the terrorist group, the journalists' lawyer, Tahir Elci, told Reuters, "They were accused of meeting and siding with both the Islamic State and the PKK-affiliated group [YDG]." Erdogan's message here is clear: his critics and dissenters and their associates are "terrorists" who must be subdued through violence, imprisonment, or both; and those who oppress them, preferably through violence and imprisonment, are the righteous ones, the heroes, the good. That ideology, unsurprisingly, links Erdogan far more closely to Islamist, authoritarian governments than to the democracies of the West. Indeed, as Scott Peterson observed in the Christian Science Monitor, "Fifteen years into his rule, Erdogan has gradually turned his country away from the secular tradition of Mustafa Kemal Atatürk, who founded the modern state from the ashes of the Ottoman Empire in 1923. And there is little room for any competing views as the once ardently secular eastern anchor of NATO, which has aspired to membership in the European Union, weakens once-promising linkages with the West, promotes the role of religion in public life, clamps down on opponents and the media, and moves ever more firmly away from democratic norms." By contrast, in America and other Western nations, reporters are free to follow their investigations. Peaceful protesters are free to voice their views. And government agents may not use violence against innocent civilians. What type of legislation is this, what type of law? It's called democracy, Mr. Erdogan. And this is what it looks like.